Sen. Michael Bennet (D., Colo.) said he has no regrets about supporting the Iran nuclear deal. During an interview with KUSA 9 on Monday, Bennet also said the $1.7 billion cash payment to Iran was "separate" from the nuclear agreement and the release of American hostages. However, a senior U.S. official told the Wall Street Journal last week that "everything was linked" in a package deal. Bennet reiterated his support for the deal immediately after telling anchor Kyle Clark that the chances of Iran cheating on the nuclear deal are "very high." "Is that a flawed deal that you felt compelled to support?" Clark asked. "We talked at length about TPP [the Trans-Pacific Partnership] as a flawed deal that you couldn’t support. As you look back on that deal, any regrets?" "None," Bennet said. "If you look at where we were when I voted on that deal, Iran had 10 bombs worth of enriched uranium and by everybody’s estimates they were within two or three months of breaking out to a nuclear bomb. Because of that deal Iran no longer has the enriched uranium necessary to build one bomb. It’s poured cement into its plutonium reactor in Arak destroying the plutonium reactor, and it no longer is spinning nearly as many centrifuges as it was before." "And on top of all of that, there are international inspectors from all over the world that are inspecting Iran’s nuclear program beginning to end," he said. "Does that mean they won’t cheat? No. Does that mean I trust Iran? No. Are we better off today from a nuclear point of view, from the nuclear threat, than we were when I voted for that deal? I think absolutely." Bennet suggested that nuclear proliferation by American allies like South Korea and Saudi Arabia would be "far more dangerous" than Iran developing a nuclear bomb. "I would say people like my opponent and also Donald Trump, who by the way is for nuclear proliferation of weapons to places like South Korea and Saudi Arabia, which I think is far more dangerous than anything we’re talking about here," Bennet said. "My opponent has said that he would rip up the deal with Iran, and so my question to him is would you take the 12 tons of enriched uranium that Iran sent out of Iran and send it back?" Bennet asked. Are you going to go take the cement out of the plutonium reactor so it functions? So that Iran can be two to three months away from building a nuclear weapon and doing it in secret without the eyes of the international community? That’s the counterfactual here." Bennet has previously said the Iran deal is "going well." Since the deal was signed last year, Iran has launched ballistic missiles in violation of a United Nations resolution, expanded its terror network in Latin America, and violated international law by detaining U.S. sailors. Iran is also preparing to reopen nuclear sites that Bennet mentioned were shut down as part of the agreement. In the interview, Bennet was unclear about the specifics of the American hostage release and ransom payment, saying they were "separate" from the nuclear deal. The deal went into effect on January 16. The same day, five U.S. citizens detained in Iran were released, sanctions were lifted on two Iranian banks, and the United States delivered the first $400 million of a $1.7 billion cash payment to Iran. "Lifting the sanctions on [Bank Sepah] was part of the package," a senior U.S. official briefed on the deliberations told the Wall Street Journal last week. "The timing of all this isn’t coincidental. Everything was linked to some degree." Congress was kept in the dark for nine months about the planned sanctions relief on Iran’s Bank Sepah, which the U.S. government has characterized as "linchpin of Iran’s missile procurement," the Free Beacon reported Tuesday. Bennet said he was "worried" about the appearance of a ransom payment for the hostages, but said he was satisfied by answers he got during an intelligence briefing, which contradicts what the official told the Journal. "What I knew was we, the United States, were trying to negotiate a deal with Iran separate from the hostage deal, separate from the nuclear deal," he said. "They’re related to the fact that Iran had sent to the United States a bunch of money to buy weapons before the Shah was deposed. That negotiation was happening at the Hague, the Hague was going to make a decision one way or another and the administration decided to settle the case with Iran, both in terms of the principal that was owed and interest as well, separate from the nuclear deal, separate from the hostage deal." Bennet said he found out about the cash payment to Iran when he "read it in the newspaper." The Bennet campaign did not return a request for comment about the payments and sanction relief being "separate" from the nuclear deal. 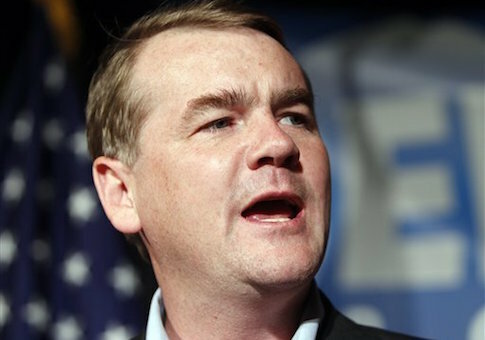 Steve House, the chairman of the Colorado Republican Party, said Bennet is "incapable of giving straight answers on tough issues." "On the subject of Iran, Bennet continued to obfuscate and deliver partisan Obama administration talking points," House said. "Despite overwhelming evidence to the contrary, Bennet repeated he does not consider the $400 million cash payment ransom and falsely asserted the broader $1.7 billion settlement was separate from the hostage releases." This entry was posted in Politics and tagged 2016 Election, Iran, Iran Nuclear Deal, Michael Bennet. Bookmark the permalink.